New from the Royal Canadian Mint is its 2013 $20 Iceberg Silver Coin, the latest release from its best-selling series of commemorative $20 silver coins that are sold at face value. The Canadian 2013 $20 Iceberg Silver Coin marks the ninth release in the series that debuted in 2011. All past issues have sold out. In a departure from the prior seven coins, its mintage limit was reduced by 25,000 to 225,000. The inaugural coin depicting maple leafs had a mintage of 200,000 and sold out in 29 days, triggering a higher 250,000 mintage for the next seven. More recent issues have taken longer to sellout, which may be a reason behind this latest coin’s lower mintage. Also and likely related, the silver values of the coins (detailed further below) have fallen this year along with silver prices. Featured on the reverse or tails side of the new $20 silver coin is Emily Damstra’s scene of an iceberg. 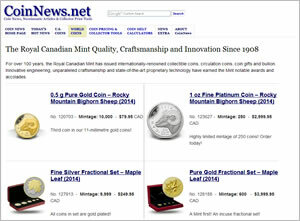 "Witness the awesome beauty of a majestic iceberg, slowly melting into the sunset over the warming summer months," the Royal Canadian Mint describes on its website. "Feared by mariners for centuries, this place, where the cold Labrador Current merges with the warm Gulf Stream, is known to many as ‘Iceberg Alley’." Inscriptions around the iceberg and swimming whales include the coin’s stated legal tender ’20 DOLLARS’, its purity ‘ARGENT PUR FINE SILVER 9999’, ‘CANADA’, ‘2013’ and ‘ED’ for the initials of designer Emily Damstra. Featured on the obverse or heads side is Susanna Blunt’s portrait of Queen Elizabeth. Inscriptions include ‘ELIZABETH II’ and ‘D.G. REGINA’. There are no edge letterings as the Iceberg coin has a serrated edge. All $20 for $20 coins are composed from 99.99% silver to a weight of 7.96 grams and a diameter of 27 mm. The weight sums to just over one-quarter troy ounce of silver (0.255919943 ounces). At the current silver spot of $19.34 an ounce, coins of the series have a silver melt value of $4.95. In contast, the very first issue from 2011 launched when silver was right near $30 an ounce. At that level, the silver coins have a melt value of $7.68. As their date implies, these are listed in the order of release. For reference, the earlier two coins from this year are linked to the coin news article announcing their release. 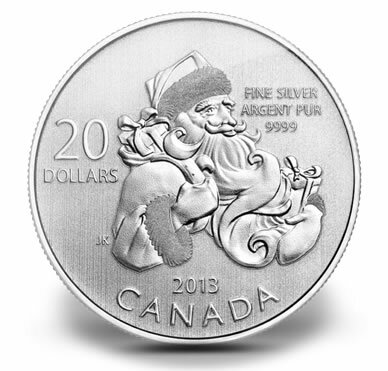 Arriving later this year is the Canadian 2013 $20 Santa Silver Coin with a unique reverse design by Jesse Koreck. Its stated mintage is also 225,000. There is not a specific release date for the Santa coin but the Royal Canadian Mint is offering a subscription option. When joining the subscription, collectors will receive the new Iceberg coin upon ordering and then get the Santa coin when it is released sometime in November. 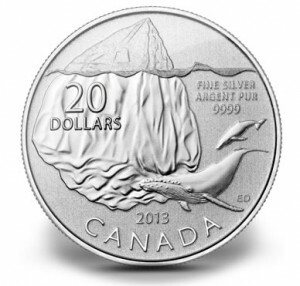 Currently, the Canadian 2013 $20 Iceberg Silver Coin is available directly from the Royal Canadian Mint website. 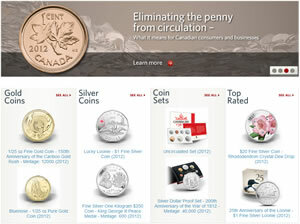 The Mint’s the $20 for $20 silver coins and the subscription option are listed here. Although these coins sell at face value and are GST/HST/PST tax exempt, the Mint does charge for shipping and tax on shipping does applies. Coins are encapsulated and placed within a folded card that includes coin specifications and the Royal Canadian Mint’s Certificate of Authenticity. We’re commemorating icebergs now? Good Lord. And they can’t even design the engraving correctly. There’s way more than 10% of the mass above the waterline..!! Just bought one for one of my kid’s birthday. These $20 for $20 are a good deal for the budget minded parent like myself.